Oh my word. By now, you are probably noticing I’m on this health kick. 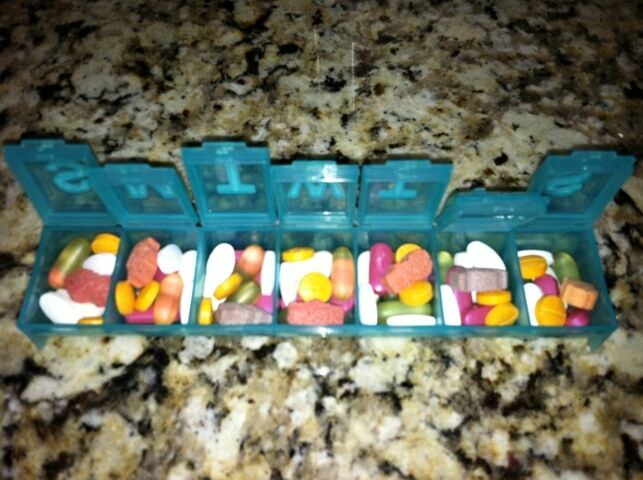 One thing I’ve wanted to start (for about 6 years) is consistently taking vitamins. My neurologist suggested a few (B12 and Magnesium), then there are hair/nails ones that I bought, Fish Oil, a daily (yes, that’s a Flinstone) and… I’m sure I’m missing one. In the end, I had to buy one of those pill cases. Yes, I am a 98 year old woman. But seriously – how can you keep up with all of this?! I can’t even take them all in one sitting. I have to split it out into two meals. I hope this actually works! Do you take vitamins? How many a day? I take one multivitamin tab a day and fishoil omega 3 from time to time. I think it wouldn’t be necessary, our food provides us with most things..
but as I have a stressful job I find it helps my immnune system. I take a prenatal. My OB recc to continue taking it while breastfeeding. I also take Caltrate (4 pills per day) since I was developing a calcium deficiency.